Buying the best tri-band router for gaming is important if you're a serious gamer or streamer and need to connect many wireless devices at the same time. It also allows you to allocate an entire 5Ghz wireless band for gaming only, helping to maximize performance for the fastest lag-free online gaming experience possible whilst running other devices in your home. Spending hundreds of dollars on one of the very best tri-band gaming routers on the market with a billion cleverly-marketed and (sometimes) over-hyped gaming features, or even just buying a good tri-band gaming router, may not be necessary at all. Many gamers could get away with a cheaper dual-band model and not see any difference in performance. But if you're a serious gamer or streamer, and will be using quite a few devices, investing in one of the best tri-band routers for gaming can be well worth it. What is a Tri-Band Router? Is it Better for Gaming? A dual-band router sends out two separate wireless signals, a long-range 2.4Ghz frequency/band, and a shorter-range yet faster 5Ghz band. 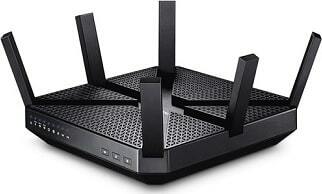 With a tri-band router you get 3 wireless signals; one 2.4Ghz band, and two 5Ghz bands. A tri-band router doesn't increase the speed to a single device, but their advantage comes into play when you're running many devices at once. Wireless bands suffer congestion when you have many devices connected and competing for the best signal speed and stability, and the extra band of a tri-band router frees up more speed to share among your devices. Plus, as mentioned, you can allocate an entire 5Ghz band for gaming purposes, yet still have 2 bands free for all your other devices. But if you don't often simultaneously use many devices in your home/office, there's no need to buy a tri-band router as you're likely not going to see a difference. But if you or other users on your home network are gaming, streaming, watching videos, playing music, etc, all at the same time, that extra band may come in real handy. Not all tri-band routers are created equal though, and it's a confusing mess of a market out there. In this buyer's guide we aim to simplify picking a good model, and we breakdown what we've found to be the current most reliable, best tri band routers for gaming and streaming in 2019 after our extensive, objective research of all the top tri-band routers out there at the moment (including new AX models). We'll cover the best extreme and high-end tri-band gaming routers for serious gamers and streamers wanting a top model with a range of helpful gaming features, but we've also picked out more affordable, mid-range and budget tri-band gaming routers that may be more suitable if you're trying to cut costs or if you don't feel you'll take advantage of all those fancy gaming features that the top models boast. If you're after the absolute best tri-band router for gaming and streaming in 2019 to future-proof for the new AX WiFi technology (802.11ax, which is also backwards compatible with AC), and you understand the fact this latest wireless standard is still developing and only in its early days, this is the router for you. Overkill for most, it contains every advanced gaming feature you could ever imagine. Of all the best tri band gaming routers on the market as of 2019, this is the king of the current crop and what pro gamers will have their eyes fixed on as their next upgrade. Asus latest AX11000 gaming router is an absolute beast in every regard, with every gaming feature out there all in the one device and then some. Case in point is it's the first router with RGB LED lighting (with a multitude of effects) that can match other Asus products. Yes, you heard right, RGB on a router. Next stop, water-cooled routers? But in terms of practical feature that most people would actually care about, the most notable feature of this monster besides the mammoth bandwidth capacity (that nobody is actually going to achieve in reality mind you), is support for the cutting-edge wireless technology, 802.11ax, also more simply known as WiFi 6. In fact, this is the first AX tri-band router on the market, so its still early days for this all-new wireless tech that will improve WiFi speeds and brings other improvements over the previous 802.11ac. Question is, if buying a new router now, should you invest the extra cash in a router with this new 802.11ax standard or not ('cause they're not cheap). This new wireless technology is still being fleshed out and improved upon, and there's no need to hurry into buying a 802.11ax router right now just because it's available. You'll need your devices to support the new standard as well to be able to take advantage of it, which may take a while, and that's assuming you're going to be upgrading your devices soon AND you'll be spending more on brand-new AX-supported device (such as the upcoming iPhone). AX (802.11ax/WiFi 6) is backwards compatible with AC though, so a good AX router is worth considering if you have the budget for it and want the most future-proof model, as you can still use all your current AC devices with it. However, getting a good tri-band router with the previous tried and true 802.11ac is still absolutely fine in 2019, because as mentioned it'll take a while for the new AX standard to catch on to the mainstream. 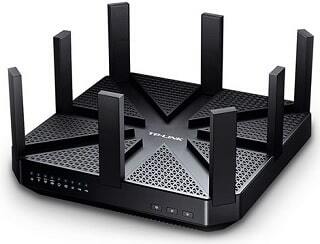 Especially if you want to save a bit of money as 802.11ax tri-band routers are going to cost you. Worth listing here is the super-slick, feature-rich Netgear XR700, which is another very good tri band router under 500 dollars in 2019. It has a special AD wireless band for super-high speeds (short-distance band though, and not many devices support it). No AX support, though. 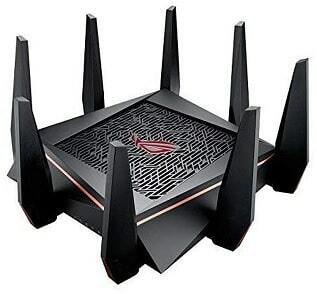 If you're after the fastest-performing, most feature-rich and longest-range router for gaming and streaming in 2019, and you don't feel you'll be taking advantage of the new and developing AX standard for a long time, Asus' flagship AC tri-band router covers all bases and then some. Once again though; overkill for most. Getting a tri-band router for the brand new 802.11ax standard is going to cost you an arm and leg, so if you want to save a bit of money (or if you don't care for the new standard which will still take a while to become mainstream) you'll want to consider getting a standard 802.11ac tri-band router. And, the GT-AC5300 is the best of the best from Asus. If you're the wired-type it has you well covered with a whopping 9 Ethernet ports (8 LAN and the 1 WAN port), but the WiFi force is strong with this one so you can pretty much take your pick between wired or wireless for some flawless online gaming campaigns without having to worry about slowdowns or dropouts (assuming your internet plan is good too). It boasts all the fancy features you'd expect from the very best tri band router for gaming such as a very decent dedicated processor (quad-core 1.8GHz), super-high AC5300 wireless speeds, a whopping 8 Ethernet ports (and yes, capable of Gigabit speeds), 4x4 MU-MIMO technology, VPN Fusion which allows you to run a normal internet connection and a VPN simultaneously, Game IPS for more fortified online gaming security, and more such as QoS and Game Boost. The GT-AC5300 also has its own private network called WTFast Gamers Private Network which further ensures that gaming traffic is optimally routed, helping to lower and stabalize ping times as much as possible. All these features may sound overwhelming, but the cool thing is you can tinker around with these settings and features in the one centralized, pretty-cool dashboard (the ROG Game Dashboard). You don't need a tri-band router for gaming, even as an extreme online gamer wanting flawless WiFi, and a good dual-band model is more than enough for most. But the three wireless bands are a nice thing to have for large homes with many devices, and you're able to allocate an entire band just for gaming traffic to avoid interference. 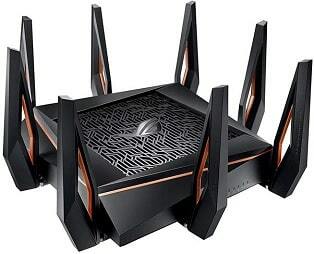 It's got 8 long-range antennas to provide unbeatable range for large homes or offices, and if you do your research you'll find it's well-received in the gaming community as pretty much one of, if not the single best, most reliable router for gaming on the planet. I would ignore some of the negative customer reviews you'll find on this one, as they're typically people who either didn't set things up properly (or couldn't), or who perhaps have been quite unlucky. The thing is, you must tread carefully when on the hunt for the best tri band gaming router, as reviews are often plagued with those who just had a bad time and do not reflect the majority who buy and use the product without issues. That goes for any router really, as public wireless product reviews are ground zero for bitter folk looking to vent their frustrations online. Although some of the downsides you'll see reported around the web are indeed valid, such as the involved setup process of the GT-AC5300 that could take you some time to get everything up and running properly (depending on your needs, though). This review here is good to further weigh up the pros and cons, and so is this one. Moral of the story is to greatly favor legit professional reviews over random customer reviews (but ideally use both in your research, as we do here with all our buying guides). Anyway, I agree with the general consensus that this is the best tri-band router for gaming in 2019 if you don't have a restriction on your budget, and can wholeheartedly recommend it as our top pick for extreme gamers, streamers, and/or heavy general internet users. Of course, it's not for everyone and overkill for some (well, probably most), so don't think you need to throw down this much monies on an extreme gaming router like this one to game flawlessly online for years to come. 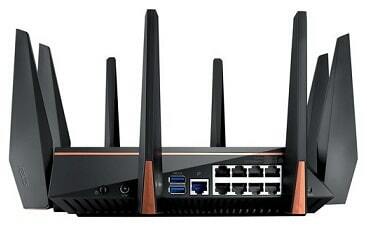 A good 100-300 dollar router can serve you very well if you choose wisely. 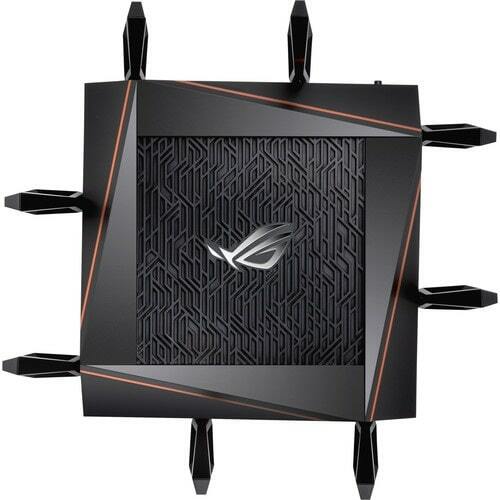 But for the best of the best, this one is well worthy of consideration and lives up to the premium Asus Rog brand which is known as the elite option for the PC Master Race gods (and usually true). If you're serious about PC game streaming services like Twitch or Hitbox, it's also our pick of the best gaming router for streaming and gaming without hiccups. Another cool-looking but most-importantly high-quality tri-band router from a respected, reliable networking manufacturer, but a few less features: our 2nd pick for the best 2019 tri-band router for gaming. Generally easy setup, too. Good overall value, high-quality tri-band router from a reliable networking brand suitable for many devices and flawless gaming and streaming. Has everything you'd expect from a good gaming router, minus the fancy features of more expensive, more polished gaming routers. The Asus GT-AC5300 and GT-AX11000 above are not for the feint of heart (read: not a practical purchase for most) and can only be recommended for the most extreme gamers or power-users and/or those with bucketloads of devices. 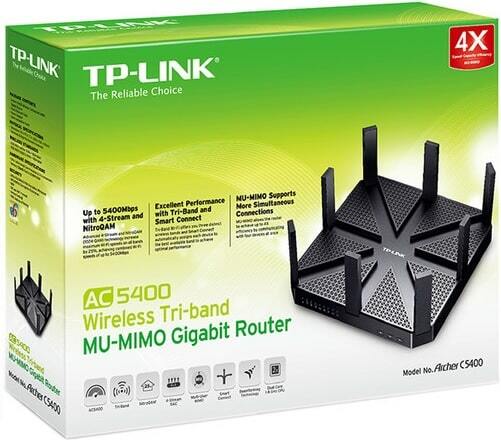 Enter TP-Link, well-known for affordable yet high-quality network products. Their Archer AC5400 is a much more affordable option, and come with all the fundamentals that makes a good high-end gaming router including high AC5300 speeds, 4 Gigabit LAN ports, 8 external antennas for long range, solid security, decent processor (1.4GHz dual-core), VPN server, MU-MIMO, and Quality of Service (QoS) which is an important gaming router feature and allows you to give priority to your gaming traffic when multiple device are online. Can't go wrong with this one. 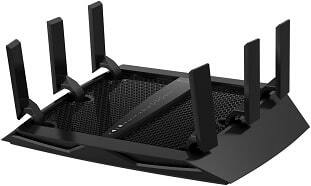 A king among AC tri-band routers in years gone by, the Netgear Nighthawk X6 is well-priced today and still relevant if you're looking for a very respectable, good-quality router for gaming, streaming and multiple devices, and see you need to pay extra for a newer model fancy gaming features (some of which aren't necessary). While there are a fair few more feature-rich, faster, and more impressive tri-band routers on the market in 2019, the ever-popular Netgear Nighthawk X6 is still worthy of consideration to this day despite it now being a few years old. You'll save a fair few bucks compared to buying one of the top-tier best tri-band gaming routers above, yet still covers the important bases you need as a dedicated online gamer. For example, you get solid AC3200 speeds, which in reality means up to 1300 Mbps when using one of the two 5Ghz bands, but that's not too shabby at all and enough for most people. It's got Dynamic QoS (Quality of Service), a bread and butter feature these days present in any "gaming" router worth its salt, and the standard 4 Gigabit LAN ports for some wired fun (plus 1 WAN port). As with most tri-band routers on the market, the range is great thanks to 6 external antennas (foldable, too). A stand out feature of the Nighthawk X6, which is common among Netgear products, is its beginner-friendly setup and interface which is much simpler and more intuitive than other routers out there. Overall, you can't really go too wrong with this one at its attractive price these days, and it's one of the best routers for gaming in 2019 when it comes to bang for buck, and a nice middle ground between the overpriced (for some) extreme gaming routers and the cheaper, slower ones. That's assuming you don't have an extremely-high, well above-average internet plan that would require a more beasty (speed-wise) tri-band unit to take full advantage of. And that's also assuming you're aware that you're buying on the tailend of the 802.11ac wireless technology, with the new AX standard to start becoming mainstream over the next few years. A basic, stock-standard tri-band device without the bells and whilstes that we can still recommend to gamers looking for something fast. Cheap (for a tri-band) yet still of decent quality, reliability, and features, with a maximum bandwidth capacity at a very respectable 3200Mbps (shared among all 3 bands). If you want the best tri-band router for gaming and general use on the cheap, this older no-frills unit will get the job done, assuming you don't need anything faster than AC3200 speeds (which isn't too shabby at all). Just don't expect top-tier reliability or anything fancy, as buying a tri-band router under 200 dollars means sacrificing modern performance enhancements like MU-MIMO technology among others. Not recommended for serious gamers or power users, but casual gamers/users who want to save as much money as possible might find a winner here. 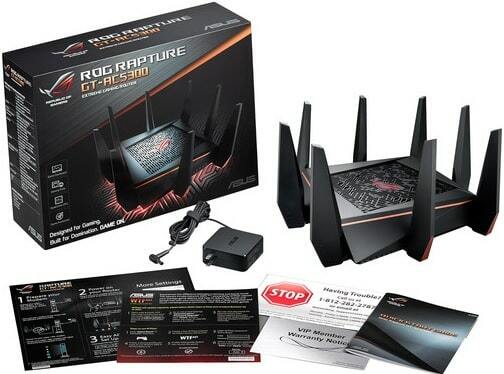 ASUS ROG Rapture GT-AX11000 review: Over the top, in every way!